On the day after All Saints’ Day, here is an appreciation of church libraries---books that continue to witness to us whether the authors are living or gone. I love church libraries. Just as a bibliophile loves shelves of books in a home, I think that a church, too, needs a room filled with varieties of texts. Such a room becomes a comforting and important ecclesial place. During the mid 1970s I began to deepen my faith and to consider my life’s vocations. That was also the time that my parents and I joined the United Methodist Church in my hometown. The library was a pleasant half of a larger classroom adjacent to the church office, with long tables for study (or more usually, for meetings), and toward the opposite wall, space for chairs to be arranged in a circle for a class. When I was first learning to write sermons, I drove to the church and tried to put my ideas together as I sat among the library books, including Bible commentaries that I consulted. Apart from sermon preparation, I found theological books fascinating: texts like George Butterfield’s Christianity and History, Will Herberg’s Protestant, Catholic, Jew, and Donald Baillie’s God Was In Christ. I liked books (at the time not that old) from the 1950s and 60s that quoted from the Barth’s Church Dogmatics or Brunner’s The Divine Imperative or Bultmann’s Jesus Christ and Mythology. Tillich's well known trilogy of sermons, and his text The Courage to Be, were also fascinating. Other titles and authors come to mind: Norman J. Faramelli’s Technethics, Harvey Cox’s The Secular City, nearly any book by Jacques Ellul, and books by two authors of then-recent memory: Albert Schweitzer and Dag Hammarskjöld. In the 1950s, Westminster Press developed a series called (long before inclusive language) Layman’s Theological Library. I leafed through these books, too, and the sight of them on used book shelves today fill me with nostalgia (along with other theological studies of the 40s, 50s, and 60s published by Doubleday, Scribner’s, Westminster, Harper & Row, and Abingdon). One Harper set that I still see in church libraries is Cynthia Pearl Maus’ Old Testament in the Fine Arts and Christ in the Fine Arts. At that time (the mid and late 1970s, when I was in college) I did not read all these books, and I don't want to imply otherwise. But my memories of these titles reflect my enthusiasm at discovering religious writing for the first time. I don’t now know if I saw all of these books in any particular church library, but I discovered several of them that way. I’m leaving out Bible reference books common to church libraries. The Interpreter’s Bible set from the 1950s stands out in my memories of early faith-explorations. The division between exegetical analysis and homiletical commentary was (fortunately) not followed in the 1990s volumes, The New Interpreter’s Bible. But in my early faith-journey, the IB was something brand-new as I studied there in our church’s library. 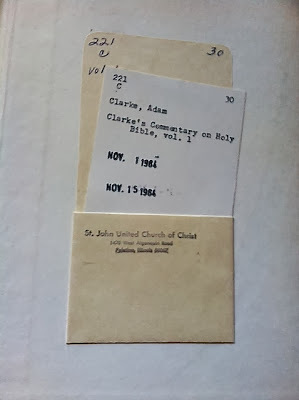 Other Bible commentaries that one could find in a parish library were some Anchor Bible volumes, Clarke's commentary, one or more theological dictionaries, a Bible atlas or two, and one or more Bible concordance. 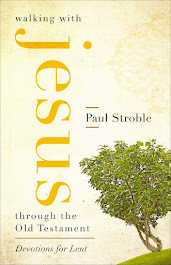 I liked the Strong’s Analytical Concordance (or as a college friend irreverently put it, “Strong’s Anatomical Concordance”), with its exhaustive listing of every word in the King James Version. When I was an associate pastor, I spent time for a month or so arranging the books in the church’s library according to topics. This task happened after I’d done the more pressing work: calling on hospitalized people and contacting recent visitors to the church. I had worked at my hometown library in the 1970s and had a good sense for categorizing of texts, short of a full-scale numerical system like the Dewey Decimal. The senior pastor seemed disinterested in my library effort, but the staff-parish relations committee, supportive of all my work, appreciated what I’d done. Do people use church libraries? I’ve a melancholy feeling that few do. Many congregations have an emphasis upon disciplining people---and encouraging members to be faithful disciples---but I wonder if the opportunity to choose a good book from the church library is part of many people’s faith-journey. "When you come, bring the cloak that I left with Carpus at Troas, also the books, and above all the parchments," writes Paul to Timothy (2 Tim. 4:13). "Parchments" would have been Bible scrolls, of better quality than papyrus. To me, it is a lovely thought that, among Paul's final recorded statements, he requested Scriptures and books to sustain him. These surely would have been his lifelong companions, too. The next time you're in a church library, browse the selection and see if any of the volumes call out for your attention. David Plowden's "Small Town America"